Doom 3 for Xbox Gets Date - Woo hoo!! Make a date with death. id Software and Activision, Inc. confirmed the week of April 4 as the worldwide release of never-ending evil, with the arrivals of both DOOM 3 for the Xbox video game system from Microsoft and DOOM 3: Resurrection of Evil, the official PC expansion pack to what critics and gamers have raved is one of the scariest games ever created: DOOM 3. Rated 10 out of 10 by XBN magazine, DOOM 3 for the Xbox brings the sci-fi horror masterpiece to console gamers everywhere. In addition to the most frightening and immersive single player game ever created, the heart-pounding title features a new co-operative campaign and exciting Xbox Live multiplayer action. The exclusive Limited Collectorâ€™s Edition also includes full versions of the original Ultimate DOOM and DOOM II playable in single player, or split-screen co-op or deathmatch with 2-4 players on one Xbox. DOOM 3 for the Xbox is developed by Vicarious Visions and id Software. 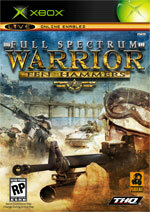 The sequel to the intense strategy/action game originally based on interactive military simulations. As squad leader, players coordinate the actions of multiple infantry fire teams, leading them throu..